Be the first to share your favorite memory, photo or story of Pastor Cynthia. This memorial page is dedicated for family, friends and future generations to celebrate the life of their loved one. 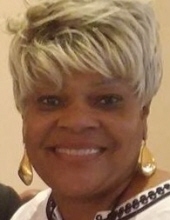 Pastor Cynthia Dale Waters Brower, 58, of Trenton, departed this life on Friday, March 22, 2019. Cynthia will be forever cherished by: her beloved husband, Wilbur Brower of the home; four sisters, Ellen Dixon, Frances Koonce (Richard), Julia Chadwick (Charles) and Shelia Fonville (Fred) all of Jacksonville; one adopted sister-of-the-heart, Lucy Erwin of Charlotte; three brothers, Jerry Waters (Janet) of Comfort, Esau Waters (Venetia) of Tampa, Florida and David Lee Kinsey (Bea) of Jacksonville; other relatives and dear friends. The family cordially invites you to attend with them in the Visitation of Family and friends to be held on Friday, March 29, 2019 from 6:00 PM - 8:00 PM at Morgan Funeral Home, Inc. and Cremations, 150 Williamsburg Parkway, Jacksonville. The Service Celebrating the Life and Legacy of Pastor Cynthia Dale Waters Brower will be held on Saturday, March 30, 2019 at 2:00 PM in the Northwest "A" FWB Association Conference Tabernacle, 1124 Ten Mile Fork Rd., Trenton. Interment will follow the service in Haiti Cemetery. Professional Service and Personal Care are being rendered to the Brower, Waters and extended families by the staff of Morgan Funeral Home, Inc. and Cremations, Jacksonville (910) 347-9595..
To send flowers or a remembrance gift to the family of Pastor Cynthia Dale Brower, please visit our Tribute Store. "Email Address" would like to share the life celebration of Pastor Cynthia Dale Brower. Click on the "link" to go to share a favorite memory or leave a condolence message for the family.